An expert in Sustainable Development, Peter Schiefke has over 15 years of experience working for humanitarian, environmental, and social causes. His passion for positive social change inspired him to found a number of local and international projects and organizations, including Youth Action Canada and the Concordia Empowerment Education Development Program based in Uganda, East Africa. 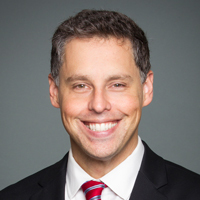 Prior to being elected to the House of Commons, he served as National Director of Climate Reality Canada, an organization founded by former US Vice-President and Nobel Laureate Al Gore. For his work, he has been awarded numerous awards and distinctions, including the YMCA Peace Prize and the Forces Avenir Award for Peace, Justice and Humanitarian Aid. Mr. Schiefke holds a Bachelor of Arts in Political Science from Concordia University and a Master of Science in Renewable Resources from McGill University. He was elected as a Member of Parliament by the citizens of Vaudreuil-Soulanges in October 2015. He is currently Parliamentary Secretary to the Prime Minister (Youth) and to the Minister of Border Security and Organized Crime Reduction.